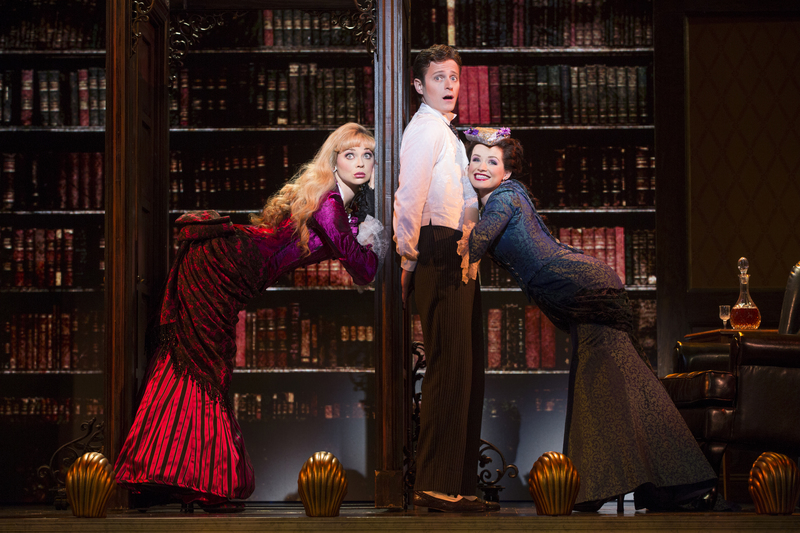 (L-R) Kristen Beth Williams as Sibella, Kevin Massey as Monty and Adrienne Eller as Phoebe. My recent trip to Houston’s Hobby Center to view the current national tour production of the Tony Award-winning Broadway musical, “A Gentleman’s Guide to Love & Murder,” somehow reminded me of the advertising slogan from years ago, “It’s not your father’s Oldsmobile.” I think in this case we might paraphrase a bit to say, “This is not your father’s Broadway musical.” The show is, in a word, unusual. With Book & Lyrics by Robert L. Freedman, Music & Lyrics by Steven Lutvak, and crisp direction from Darko Tresnjak, it is based on a 1907 novel by Roy Horniman, and its black-humored plot begins in England in that very year. With the tongue-in-cheek mischief of its opening number, we see a spooky group of mourners who look as though they just popped out of some ancient black & white photograph as they sing the playfully ominous, “A Warning to the Audience.” It cautions all present that there may be trouble ahead. And trouble there will be as we learn the tale of a poor young man named Monty Navarro (Kevin Massey), whose widowed mother has just passed away. His sadness is pleasantly interrupted when an ancient washerwoman named Miss Shingle (Mary VanArsdel) arrives to pay her respects. In her cheerful and tongue-twisting song, “You’re a D’Ysquith,” she reveals that Monty’s mother was actually highborn of the aristocratic House of D’Ysquith, although the family had long ago disowned and disinherited her for her scandalous elopement with the mere Spanish musician who would be her late husband. Armed with this knowledge, Monty realizes he is ninth in the line of succession to inherit the earldom of Highhurst. His quest to move up that ladder and become the earl is the mischievous device that propels the following merriment and mayhem alluded to in my title. Numerous elements make this journey a pleasant one, beginning with the eye appeal of the unique staging that plays out in a kind of sub-proscenium arch with Greco-Roman accents. Surrounded with its crimson velvet curtain and appropriately blood-red lighting, it embraces the action in a smaller, center-stage space than the usual full staging. Thus, it focuses each colorful scene to look a bit like an antique postcard of the period. (Scenic Design by Alexander Dodge, Lighting Design by Philip S. Rosenberg). Adding to the attractive look of the piece are the colorful period costumes of designer, Linda Cho, especially the elegant dresses and gowns for the ladies. 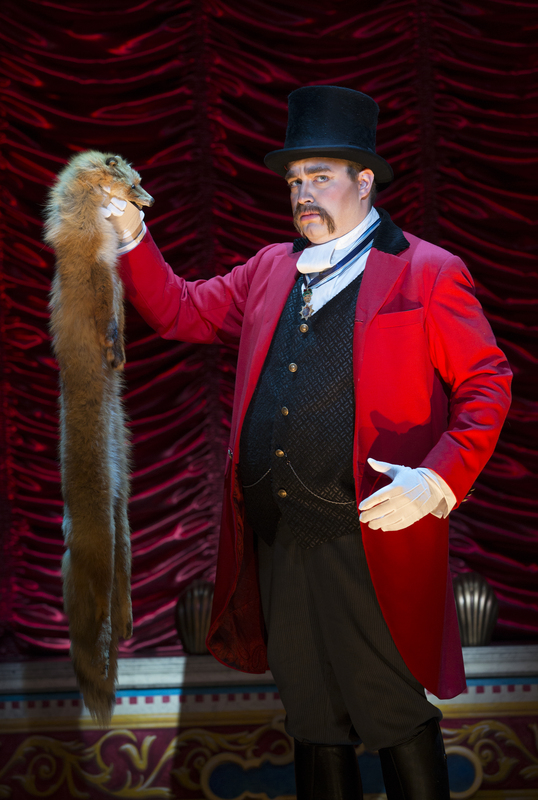 In addition to the smooth-voiced Mr. Massey, the vocally talented cast has two marvelous and very beautiful sopranos as Monty’s competing love interests, Sibella (Kristen Beth Williams) and Phoebe D’Ysquith (Adrienne Eller). That trio brings abundant slapstick hilarity to the Act Two number, “I’ve Decided to Marry You,” and I agree with audience member, Rick Wessells, who remarked after the show that scenes like that were reminiscent of the zany and frenetic comedies of the silent film era. But we cannot speak of hilarity without turning our full attention to the uproarious and wide-ranging performance of John Rapson, who anchors all this charming nonsense by alternately portraying each and every D’Ysquith family heir (of both genders) throughout the amusingly murderous efforts of Monty to rub them all out and claim the earldom for himself. Navarro and John Rapson as Asquith D’Ysquith, Jr. Whether heirs “accidentally” fall to their death from a bell tower or slip through the ice while skating on a pond, the laughs keep coming, with the exception perhaps of a dining room scene near play’s end that seemed disorganized with its lack of focus. Meanwhile, the music is pleasant enough with a cast and ensemble that at times seem almost operatic in their skill. (Music Director, Lawrence Goldberg). 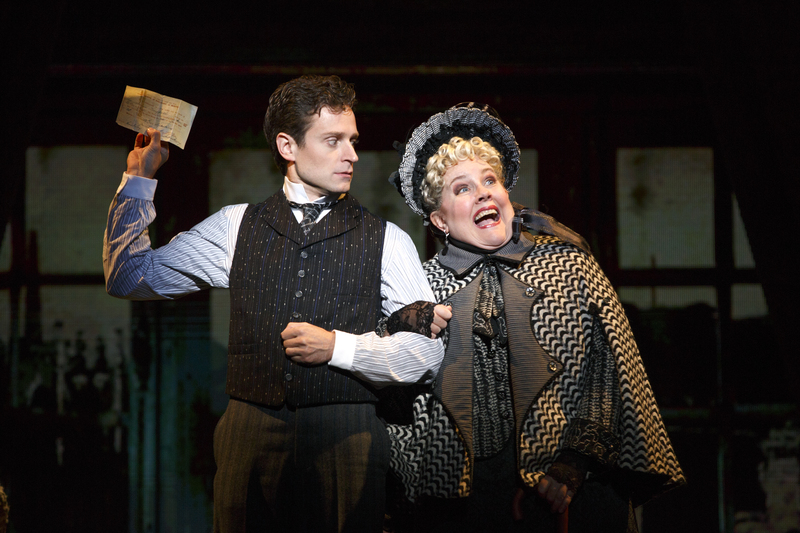 Phoebe’s song, “Inside Out,” is lovely from Miss Eller, and Massey delivers a richly romantic and resounding, “Sibella.” Other tunes remind one of the rapid-fire patter songs of Gilbert & Sullivan, but some lyrics do get lost amid the speed. When I say, “this is not your father’s Broadway musical,” it is because we are not talking the infectious melodies of Rodgers & Hammerstein here. Audiences are unlikely to go home humming any of these songs from memory, but the tunes work very well to accompany the lighthearted action, and occasional delightful choreography from designer, Peggy Hickey. If folks don’t go home humming, they may at least go home happy. 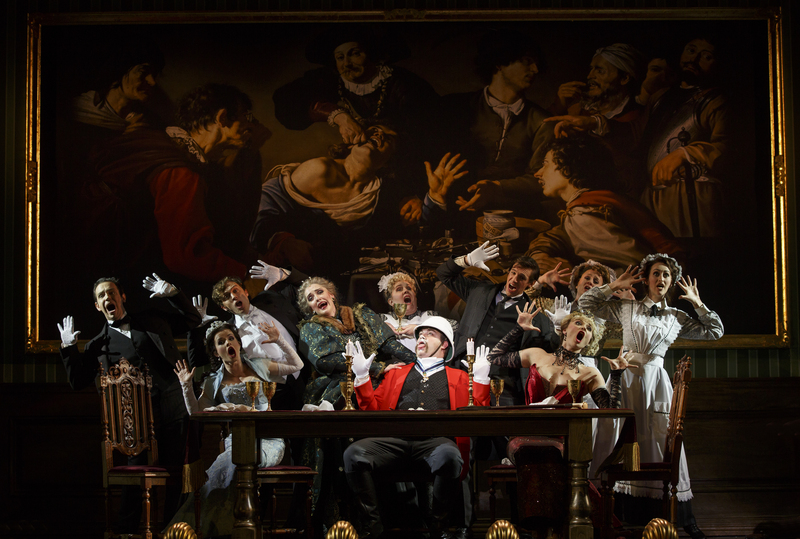 A GENTLEMAN’S GUIDE TO LOVE & MURDER continues through May 15th at Houston’s Hobby Center main stage with performances Tuesday, Wednesday, Thursday, & Sunday at 7:30 pm, Friday & Saturday evenings at 8pm, and Saturday and Sunday matinees at 2pm. For tickets visit the website at www.TUTS.com, or call (713) 558-8887 locally, and (888) 558-3882 (outside of Houston). 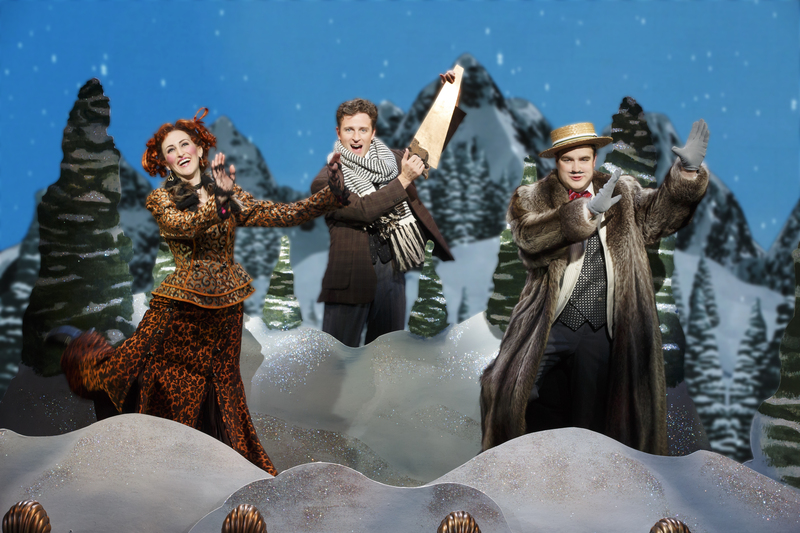 This entry was posted in Broadway, BroadwayStars.com, Gentleman's Guide to Love & Murder, Houston's Hobby Center, The Courier Columns, The Villager Columns, Theater Reviews, ThePeoplesCritic.com, YourHoustonNews.com and tagged A Gentleman's Guide to Love & Murder, Broadway, Theatre Under the Stars. Bookmark the permalink.